Pozoruhodný tajemný šamanský rituální ambient z Ruska. Our wise ancestors considered fire sacred and worshipped it, endowed with magical properties. The fire was believed capable of protecting from any negative influences. The flame of the candle helps to purify the soul and aura, to practice meditation, to enter into a higher spiritual sphere and to be heard by the Universe. Fire is the most powerful, beneficial and mysterious force of nature that bestows health and prosperity. STATUS Prod. presents "Live Fire Meditation" from Voronezh ritual / dark ambient project ORD. Fire meditation is a contemplative practice. 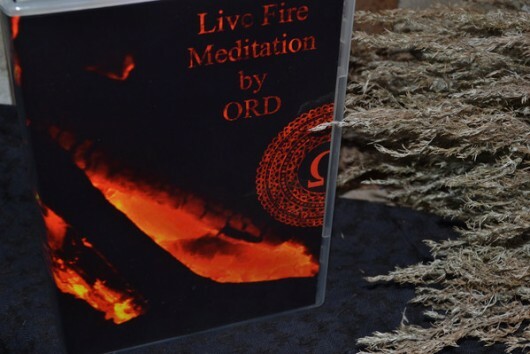 Flame of handmade candles in combination with audio next,etched on CD, allows you to focus on your internal state, to reveal internal reserves. At the same time, a DVD with video of the fire ritual is a full replacement for live fire. Herbal tea will contribute to a soft exit from meditation, warmth and peace, saturated with aroma and taste of herbs picked by hand. Fire ritual was held Ord Err & Darina Voinova 09.06.2017 on the 16th day of the lunar cycle, full moon. Fire meditation was held by Ord Err 18.06.2017 n cultural center “Shangrila” Voronezh,Russia.